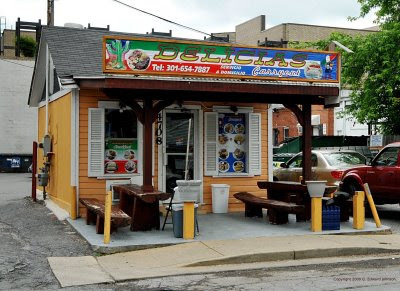 Delicas is a stand-alone carry out at 4708 Highland Ave, half a block off Wisconsin Avenue in Bethesda, MD. It is smaller than it looks from the outside, I was the third person there and it was cramped. There is no seating inside, but two rustic picnic tables on the outside. I got the Super beef burrito, seasoned ground beef with lettuce and tomatoes. It was tasty and exactly what I expected. The only negative was that by the time I got to the end, some grease was dripping out of the burrito. They have a selection of sodas in cans and bottles too. I enjoy going to out-of-the-way places that really give you a flavor for the town. This is certainly one of those spots I can't believe I have never found it before and plan on going back to try the pupusas soon. I read that this restaurant was robbed last December, too bad. I forgot about that place. I think it used to be called Chelsea's Place way back in the mid '80's when I used to get take out there, which was awesome. Good to see a restaurant is still there cranking out decent Mexican food and I think I may hit it when I'm in Bethesda next. I've had enough of Baja Fresh, Chipotle. I had no idea the building was even there until about two weeks ago. I never would have guessed it has been a restaurant for over 20 years.